Instant Pot Nikujaga 肉じゃが (圧力鍋) is a quick, Japanese home style beef stew. It hits all the right spots for a beef stew - warm, filling, and savory with the perfect mix of carrots, potatoes, and green beans or snap peas. Serve with miso soup and a hot bowl of rice for complete set meal. Put the green beans and water in a covered glass container and stick it in the microwave. Cook 2 minutes on high, stir the beans, and then cook in 1 minute intervals until your desired texture (I like them with a bit of crunch still). Drain and set aside. Optional: If you want to keep the nice green colour of the beans, prepare a bowl of cold water and ice. Immediately toss the cooked green beans in the ice water until completely cool. Drain and set aside. Press the “Sauté” button on your Instant Pot and heat 1 Tbsp. vegetable oil. When the Instant Pot screen says "Hot", add onion and saute for 2-3 minutes. Add the meat and stir until combined. Add the potatoes, carrots, and drained shirataki noodles. Add the sugar, dashi, mirin, sake, and soy sauce and stir until everything is combined. Press “Keep Warm/Cancel” button on the Instant Pot to end the saute. Cover and lock the lid. Move the dial to "Sealing". Press the “Meat/Stew” button and Adjust the cooking time to 12 minutes. Quick Release the pressure after the cooking is complete, stir in the green beans, and serve! 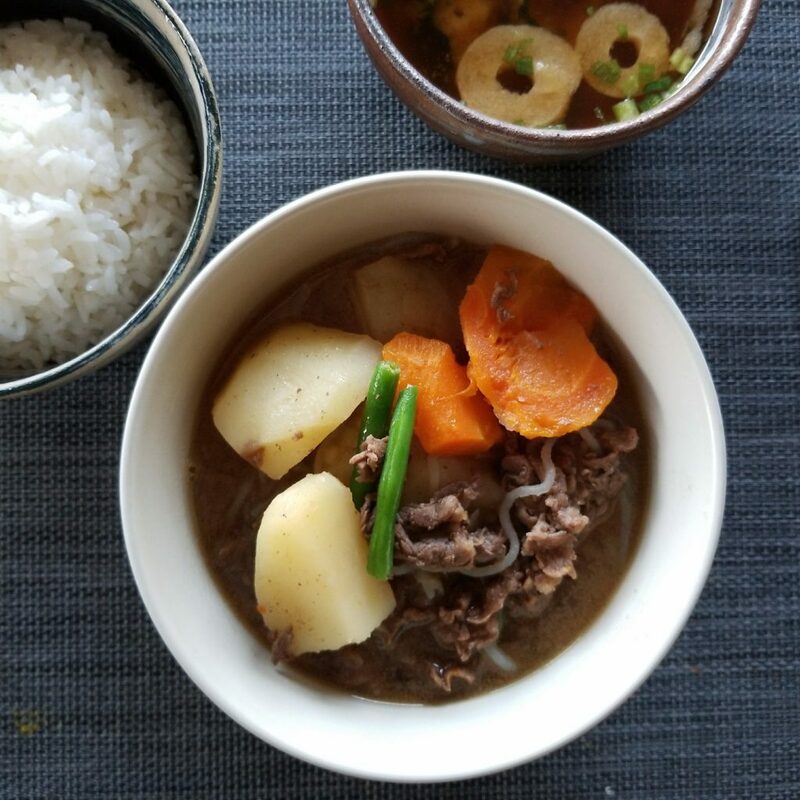 This Japanese beef stew is warm, filling, and quick to prepare.